Younger players often pay many compliments to the elder statesmen of the game but I think Anthony Kim and Rory McIlroy have found the fluffiest way to honour two great players. 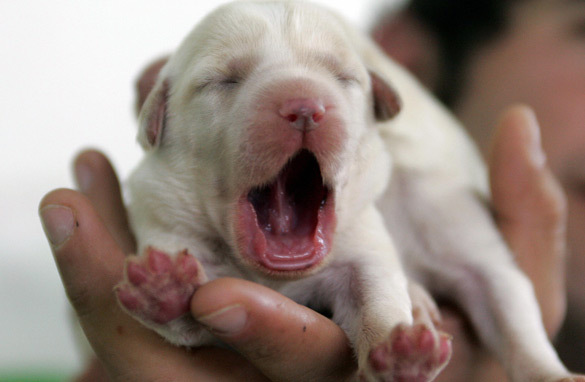 A three-day-old 'Labradoodle' for those unsure of their appearance. Both own Labradoodle dogs (a cross between a Labrador and a poodle) and during a recent round together they discovered something in common. McIlroy named his dog Theo, after Ernie Els, the South African who’s full name is Theodore Ernest Els. While Kim named his dog Norman in honor of the Shark who is Greg Norman, the great Australian two-time major champion. Let’s just hope both younger players don’t lose the Open to either elder opponent in a play-off – or both animals might be called mongrels when they get home! Now down to the business of the first round. Who would have thought that the oldest player in the field and one who was involved in the most dramatic Open Championship duel in 1977 would be right up on the leaderboard on day one. Tom Watson, who is 59-year-sold, yes that’s right 59! must have been on an adrenalin rush when he played on Thursday. He was perhaps driven by that famous Duel in the Sun in ’77 with Jack Nicklaus that saw Watson come out on top by the slimmest of margins. Five under 65 on a course that is vastly longer and the fairways much tighter than ’77 showed up the rest of the field during the early stages. Whatever happens for the rest of the day it will be a talking point leading into Friday.